The Goodwill Festival is a most auspicious time for attuning to our spiritual self and the divine nature of all Humanity. At the full moon, people come together on the inner and outer planes, in group alignment, to amplify this awareness and expand the channel for impression and the distribution of Goodwill energies. This Festival thus presents the perfect opportunity for world servers to dedicate or re-dedicate our service to, and alignment with, Divine Life, Light and Love. This dedication is a conscious declaration that one's purpose in life is the establishment of the Kingdom of Heaven on Earth. This entails the conscious surrendering of one's life to Divine Will. One's vehicles ~ physical, emotional, mental, and spiritual, are consecrated, or re-consecrated, to this end. One's immediate aim is now to ever deepen Soul contact and to act according to the impressions received. The temperings and purifications choreographed by Soul are now welcomed as one is rendered suitable for ever greater realms of service. 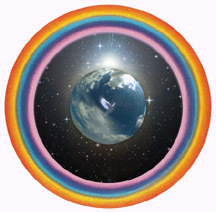 This is one's active cooperation with Spirit and the Greater Guiding Ones to make manifest Life Divine on Earth. If you want to be one of the “Chosen,” choose yourself. Consecrating ourselves to serving the Most High and the Greater Good is, at heart, an inward solitary act. In meditation or prayer, we may ask Spirit to illumine our path of service, request a job, or increase our ability and resolve to serve on a path upon which we have already embarked. The 2018 festival full moon occurs on Tuesday, May 29 at 7:19 am PDT / 14:19 UT. This may or may not be a convenient time to arrange for a physical group gathering, depending on your time zone; regardless it remains an optimum time for a personal ritual of consecration or rededication. Any time up to two days prior to, or within two days after the full moon, we may arrange for a physical group ritual that will be enhanced and empowered by the uprising of like-minded energies coursing through the planet. Bearing witness to our personal dedication in group enables our peers to hold and fortify us in the new light of commitment and service. - Sanctify the ritual space, setting the stage for connecting with the group soul with a dedicated altar, saging, incense, and reflective or uplifting recorded music. - Invite participants to cleanse and purify prior to the ritual through meditation, a walk in nature, or a ritual herbal bath. - Begin by hallowing the space and time with a group prayer or invocation. - Individuals may each light a candle on the altar as they affirm their rededication. - An Evocative Keynote may be drawn for the next year’s focus. These Keynotes align us at a global level with other kindred souls and spiritual groups who are actively meditating on them with the intent to build a new world order. - A song or two may be sung together by the participants. Singing the vision in unison aligns our hearts and souls in potent and magical ways. - A guided meditation hooking the group up to Shamballa or the Planetary Soul leading into a time of silent meditation, feel free to utilize SouledOut's Goodwill Festival Meditation Audio Player. - Following the meditation, share impressions received. - Collect donations for an organization outside your own that is making a positive difference in the world. This deepens our experience of selfless service, and our connectedness to the greater world vision. - Recite The Great Invocation in group formation, we encourage participation in the World Invocation Day Vigil. And Their Higher Spiritual Possibilities. These elements may all be used or not, arranged and adapted to suit the needs and temperament of your particular group. To The Glory of The One!